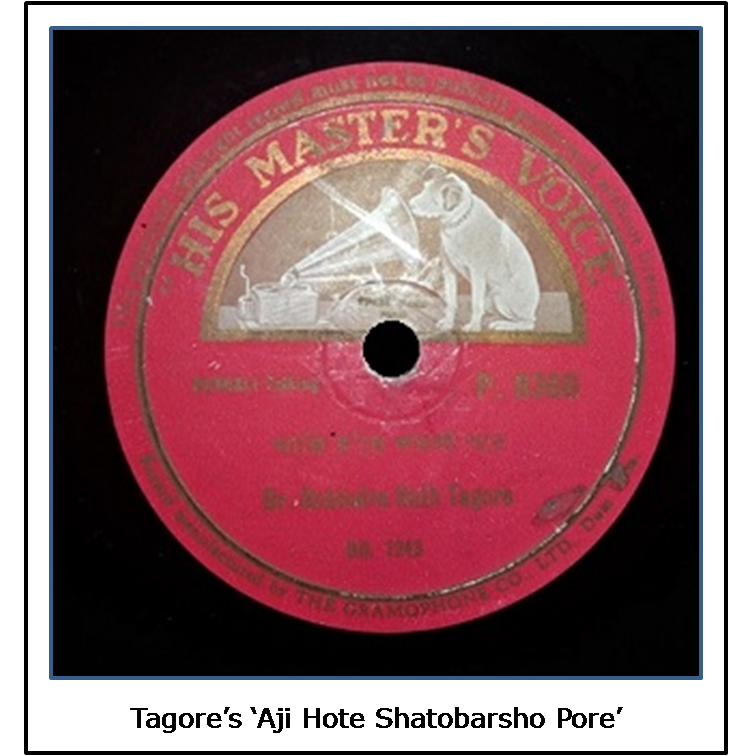 Rabindranath Tagore’s association with the recording industry began in 1904. 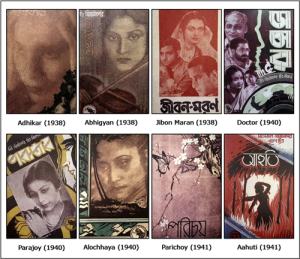 An exploration of the sound recordings of Tagore and Rabindra Sangeet by Sounak Gupta. The history of sound recording in India takes us back to the 8th of November, 1902, when Fredrick Gaisberg, the American-born musician and recording engineer brought in two young girls barely in their teens, to the Great Eastern Hotel, where he had set up a makeshift studio. A nasal voice sang into the horn – ‘Ami ki sajani kusumeri’ (E 1001) while another rendered, ‘Saral mone, saral prane’ (E 1002). Gaisberg remembered the girls as ‘two little nautch girls aged fourteen and sixteen with miserable voices’. Whatsoever, the little girls, namely Sashimukhi and Fanibala, created history, being the first recording artistes of the country. Rabindranath Tagore’s association with the recording industry began in 1904. No, it wasn’t the poet who came in to record his voice. An artiste of fame, Dwijendranath Bagchi sang for record, ‘Keno jamini na jete jagale na’, which was the first of Tagore’s compositions to be recorded. Bodhu chole jale loiya gagari. It could be noted that Bagchi left out an entire stanza, besides singing several other lines as per his wish, paying least attention to the original lyrics. 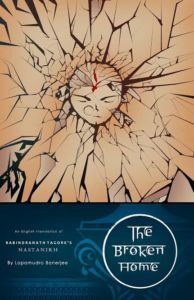 Though he sticks to the ‘ektaal’, he doesn’t follow the notations of the song as available in the fiftieth volume of ‘Swarabitan’ published from Vishwabharati. Also, Bagchi adds some musical ornamentation (murkis) towards the end of the song (which he doesn’t repeat the second time he starts from the antara). The very next year, we have Manadasundari recording ‘Majhe majhe taba dekha pai’. An artiste from the Bettiah schooling, Manada’s rendering follows more of the techniques of her gharana, than any style which could be termed ‘Rabindrik’ or Tagorean. The song, tuned in Kafi, has been rendered by the artiste in Sindhu. This again, is a clear indication to the freedom taken by the early recording artistes of Tagore’s songs. The same year, we get Purnakumari’s record of ‘Ami chini go chini tomare’. The artiste here clearly takes liberty in changing the lyrics at several points. Also, the song originally tuned in Jhinjhit (as published in ‘Bangalir Gaan’ in 1904, and Khammaj, as in the fiftieth volume of ‘Swarabitan’, from Vishwabharati) has been sung in Sindhu by Purnakumari. Purnakumari’s record of ‘Purano sei diner kotha’, released in the same year, again shows signs of the liberty taken by the artiste. Purnakumari sings the song, originally tuned in Bhupali Mishra, in Behag-Khammaj, besides changing the lyrics at various points. 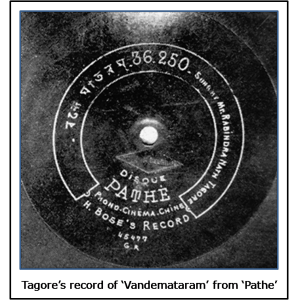 ‘Pathe’ introduced Tagore as a recording artiste in their catalogue (1906), while the recording of ‘Vandemataram’ saw the light of the day. It is unknown if, at this point of time, Tagore had been aware of the fact that his compositions were being recorded. Rabindranath’s direct association with the recording industry began in 1905. Those were the stormy days around the time of the Partition of Bengal, when Hemendranath Bose, thought of recording nationalist songs in Tagore’s voice, as a way to awaken the nationalist spirit in common men. 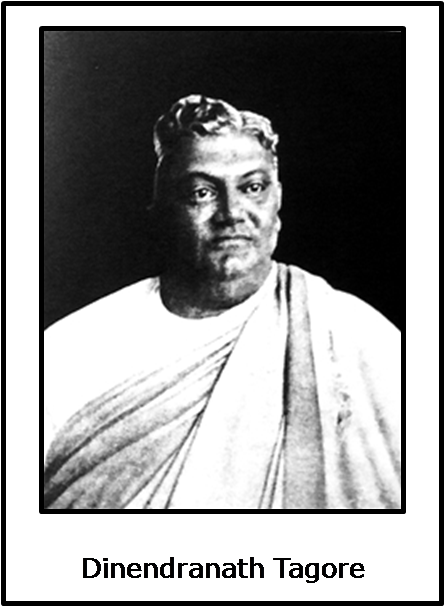 It is known from one of Devendramohan Bose’s (Hemendranath’s cousin) documented lectures that Hemendranath had made several phonograph records of nationalist songs in Tagore’s voice, at Acharya Jagadish Chandra Bose’s residence, none of which, unfortunately, could survive for long. The earliest surviving recording of Tagore’s voice is a two minute forty-six second-long snippet of Bankim Chandra Chatterjee’s ‘Vandemataram’, tuned by Tagore (in the recorded version) published from ‘Pathe’. Several songs and recitations in Tagore’s voice were supposedly recorded during this time, however, none of those, probably exists any longer. ‘Pathe’ introduced Tagore as a recording artiste in their catalogue (1906), while the recording of ‘Vandemataram’ saw the light of the day. Amal Holme writes, ‘…Rabindranath had rendered ‘Vandemataram’ on record. It is sad that most listeners are unaware of how his voice was, during those early days, as most of the early recordings no more exist. If they did, one would have known, Tagore’s voice was nowhere close to feminine, but bold and spirited.’ Holme’s saying does prove true, that now, Tagore’s recording of ‘Vandemataram’ has been found (thanks to the ‘Genius Rabindranath Tagore’ album, published from AIR in 1999). And you will know what a taking machine can do. are very loud, very clear and very natural. They reproduce the human voice in its perfection. No hissing, no screeching, no metallic or foreign-sound and you don’t change the needle every time. When you hear H. Bose’s Records you no longer hear a machine but the singer himself appears to be singing before you. have very kindly allowed us to record their voices and this is a privilege which has not been conferred upon any one else. PLEASE COME AND HEAR THEM, YOU NEED NOT BUY. As no other recording by Tagore made during the early 1900s is available with me, my possibilities to throw light his early recordings is largely limited. However, we could easily conclude, from the only sample available, is that, his voice was forceful and emphatic. That Tagore would often appear onstage to enact his plays while singing the songs himself, and publicly sing on various occasions is clear from his full-throated rendition. The early phase of recording Tagore’s compositions leaves one dissatisfied, with several recording artistes taking too much of liberty while singing. However, there was one artiste of this phase, whose recordings sound credible. She was Deshbandhu Chittaranjan Das’ sister, Amala Das. Amala had been a close associate of the Tagore family, and a close friend of Tagore’s better half, Mrinalini Devi. She was no less than a family member to Rabindranath, and had received musical training from legendary Radhikaprasad Goswami, one of the eminent family-tutors of the Tagores. The well-trained dulcet-voiced Amala, would regularly sing before her ‘Rabikaka’ (Uncle Rabi/Rabindranath). As Sahana Devi, another of Tagore’s associates, recalled, the poet had composed ‘Chirosakha he’, keeping in mind, Amala Das’ voice. 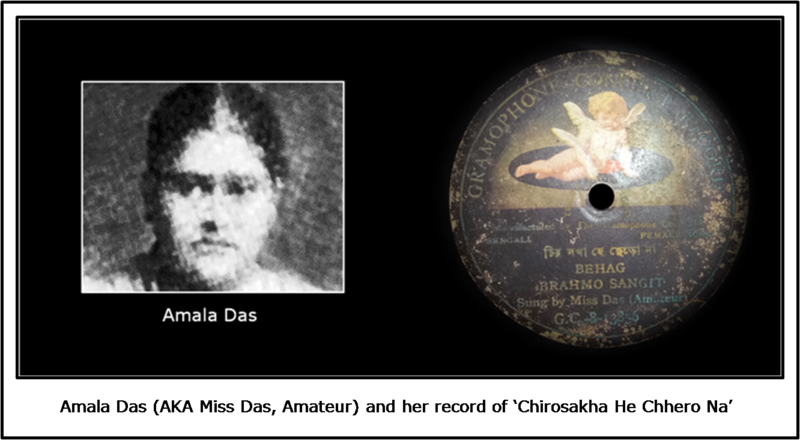 A record featuring ‘Chirosakha he’ in Amala’s voice, was released in 1910, and is a treat to hear! 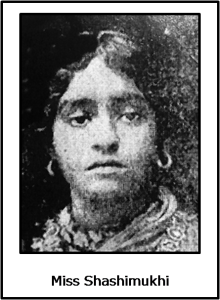 Several artistes besides Amala Das had recorded Tagore’s songs during the two decade-period between 1905 and 1925. A list, if made, would include Satyabhushan Gupta, Kunalchandra Sen, Radhikaprasad Goswami, K. Mullick, M. N. Ghosh (Monta), Gopeshwar Banerjee, Bedana Dasi, Miss Krishnabhamini, Miss Ascharyamoyee, Miss Angurbala, and others. However, detailed discussion on their recordings isn’t quite relevant in this essay, as those are far from being identified as Tagore songs! Tagore had himself been extremely displeased when he came across those records in the 1920s, and learned about the liberty the artistes had taken at rendering his compositions. 1926 marked the inauguration of electrical recording, at the studio of the Gramophone Company, then in Beliaghata. On the very day of inauguration, Tagore’s voice was recorded. That was the second time the poet came into the recording scenario. 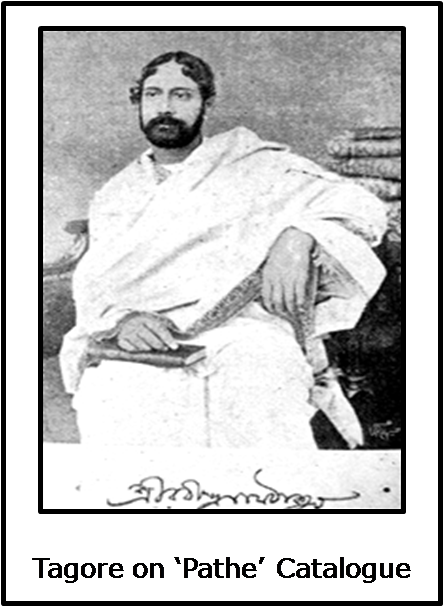 He recorded two songs, ‘Andhajane deho alo’ (P 8367), ‘Ami sangsare mon diyechhinu’ (P 8367), and four poetry recitations, ‘Aji hote shatobarsho pore’ (P 8366), ‘Abirbhav’ (P 8366), ‘Readings from Gitanjali’ (P 8368), ‘Readings from Crescent Moon’ (P 8368), and the history of electrical recording in India began. The record catalogue of the July, 1927, referring to these records, mentions something interesting – ‘The two records of poetry recitation, played at 78 RPM speed, and the record of songs, played at 80 RPM speed, would sound very sweet.’ That this was the first set of electrical recordings, the speed issue can easily be pardoned, however, never again was this information printed on the catalogues, while the recordings were re-released several times, in later years. Hence, how many of us have heard the recordings as they should sound, remains a question! Company, then in Beliaghata. On the very day of inauguration, Tagore’s voice was recorded. That was the second time the poet came into the recording scenario. He recorded two songs, ‘Andhajane deho alo’ (P 8367), ‘Ami sangsare mon diyechhinu’ (P 8367), and four poetry recitations, ‘Aji hote shatobarsho pore’ (P 8366), ‘Abirbhav’ (P 8366), ‘Readings from Gitanjali’ (P 8368), ‘Readings from Crescent Moon’ (P 8368), and the history of electrical recording in India began. “The Company shall for the consideration hereinafter stated have the exclusive right for ever to manufacture, multiply, publish and sell all records for use on Talking Machines already made by the Composer of the songs and recitations mentioned in the Schedule hereunder (I’m refraining from producing the schedule, as it isn’t relevant for this article) and shall for a period of five years from the date hereof have such exclusive right to manufacture, multiply, publish and sell all further records which may hereafter be made by the Composer of the said songs and recitations. The Company shall have the exclusive property in and the sole right for ever to manufacture and multiply all records so made or to be made by the Composer of the said songs and recitations and the Composer shall not during the continuance of this Agreement talk or sing or carry out any performance for the purpose of making talking machine records of the said songs and recitations. This was the first time that Tagore signed a legal agreement with the recording company, following which, the recording and marketing of his compositions without his knowing, became impossible. Hence, there was no chance left for any artiste to take liberty at singing Tagore’s songs, as the poet was made aware of each release, and most of the sample discs were first approved by him, before being marketed. Dinendranath’s recording of ‘Amar matha nato kore dao he tomar’ has a bit of history behind it. This song had been earlier recorded by K.Mullick in 1920. It is heard that, Tagore was so displeased listening to the record that he immediately requested the company to stop the sale of the record. He then had Dinendranath record the same, the way he expected his song to be rendered. The two versions of the song (one by K.Mullick and the other by Dinendranath Tagore) are being provided here for a comparison. The majority of the artistes rendering Tagore songs post 1926, were trained directly by the poet, or by Dinendranath. Hence, the authenticity of the renderings henceforth could be considered perfect, though, not always do they perfectly match with the printed notations of Tagore’s songs published in the several volumes of ‘Swarabitan’, by Vishwabharati. There could be various reasons behind this, but none are relevant for discussion in this article. Sahana Devi’s comment stands true, as, in none of the song recordings in the voice of Tagore, has the poet used a Tabla to keep the rhythm. How the use of percussion instruments with Tagore songs became popular in later times is a question. Perhaps, the use of these instruments during the performance of the dance dramas of Tagore, inspired later artistes and trainers use them in song recordings as well. Notably, although the poet himself disliked the use of Tabla in renderings of his songs, he probably wasn’t too strict about it. 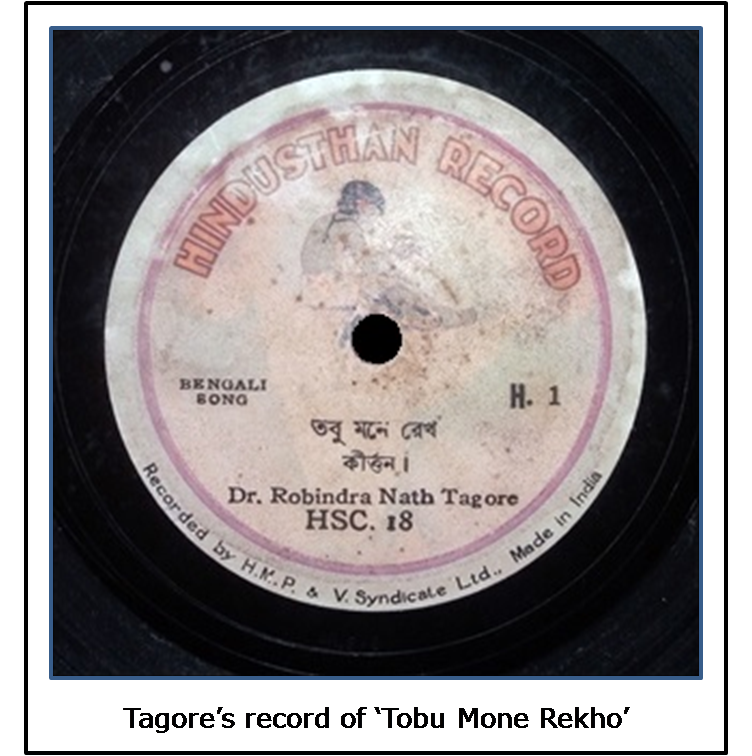 Several records approved by Tagore in his final years feature of the use of Tabla. Probably the greater availability of capable Tabla players in the later years persuaded the poet in allowing the use of percussion instruments as an accompaniment to his songs. After Rabindranath’s five-year contract period with the Gramophone Company ended in 1931, the poet came back to the recording scenario, this time, to the Hindusthan Company. Tagore had written to Basanti Devi (wife of Deshbandhu Chittaranjan Das) on 20th March, 1932, “A gentleman has returned from Europe, having learnt techniques of sound recording for the Gramophone. He had come to me with a request to record my voice.” This was Chandicharan Saha, the founder of the Hindusthan Company. 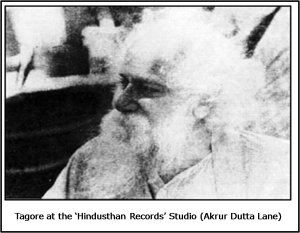 On the 5th of April, 1932, Rabindranath set foot on the Akrur Dutta Lane studio of the Hindusthan Company for the first time. 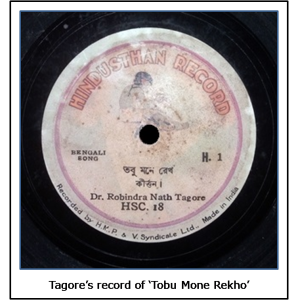 The first ever record released by the company, bears ‘Tobu mone rekho’, a song, and a poetry recitation, ‘Ami jakhon babar mato habo’ by Tagore, the record serial being ‘H 1’. The poet had recorded for the Hindusthan Company in three turns – the first in 1932, then in 1934, and for the final time, in 1939. In 1932, Tagore recorded his only existing duet with Roma Kar (Nutu), ‘Tomar surer dhara’. However, for unknown reasons, the record was never released. Decades later, the sample was unearthed by Subhendusekhar Patra and Surajlal Mukherjee, from whose collections the Hindusthan Company released a portion of the song on cassette, in 1995. “The poet came. His health was failing. Those were the days when tape recorders weren’t available. Hence, once recorded, we had no way to play the disc immediately. However, for the poet, we made an arrangement to play the disc after recording. 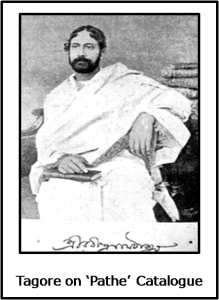 Bula Da (Prafulla Chandra Mahalanbis), who had come with the poet, said, “You have to record it once again”. “Why? It sounds quite good”, replied Tagore. “No, that was a test recording. Let’s do the final recording now”, said Bula Da. 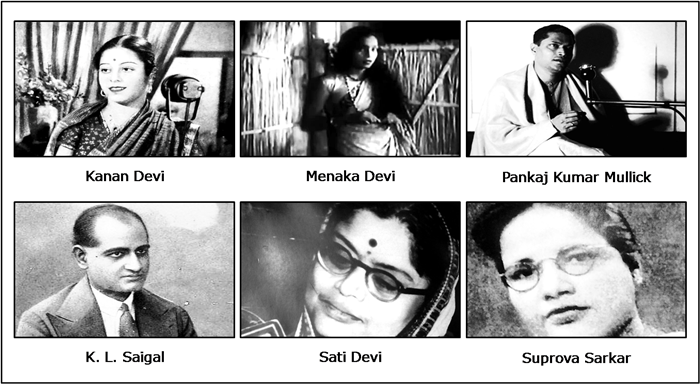 This era had several students of Santiniketan, getting their breakthrough as recording artistes. In 1932, Savitri Devi (Krishnan) cut her first (and probably only) disc from the Hindusthan Company (H 8). 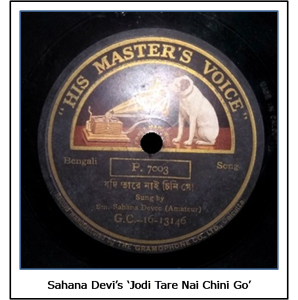 1933 had Santidev Ghosh cutting his first disc as Santi Ghosh, in a chorus rendition with Sudhin Dutta, Amala Dutta and Nandita Devi (H 191). 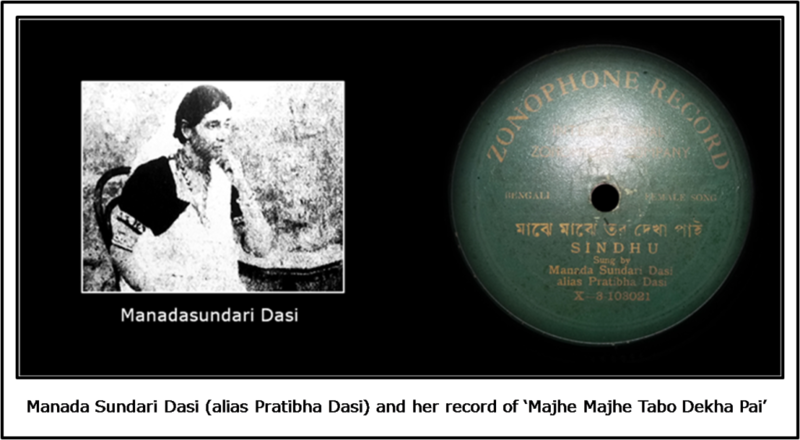 In 1935, Amita Sen ‘Khuku’ cut her first disc from the Hindusthan Company again (H 262). 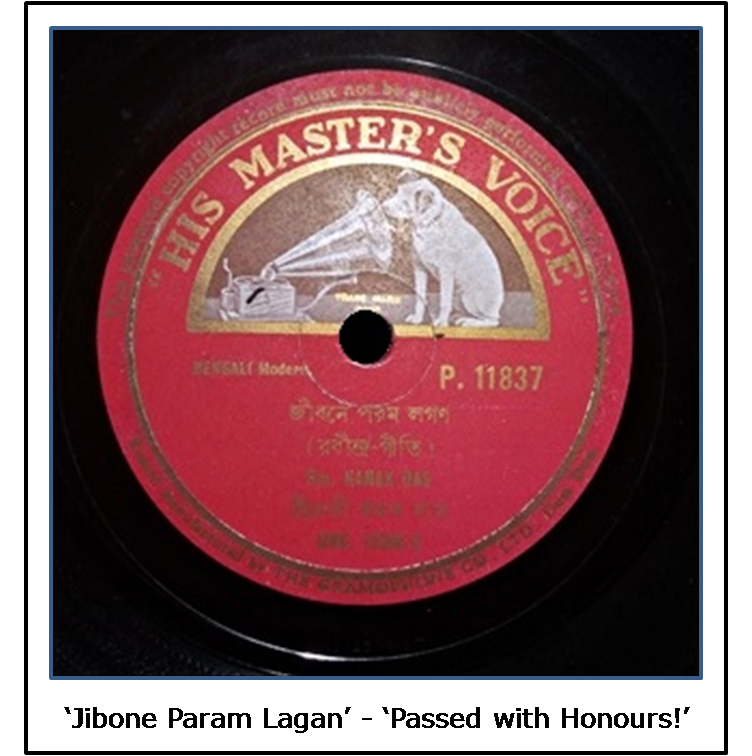 The institution had Kanika Mukherjee (later Banerjee) record her first Tagore songs in 1938 (H 648). 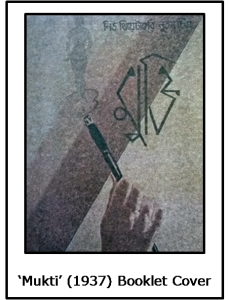 1941 had Rajeshwari Basudev (later Dutta) cutting her first disc, again from the Hindusthan Company (H 920). Songs like ‘Adheko ghume nayano chume’, from Amita Sen’s first record, ‘Mone ki dwidha rekhe gele chole’ from Kanika Mukherjee’s first record, are always a pleasure to hear! 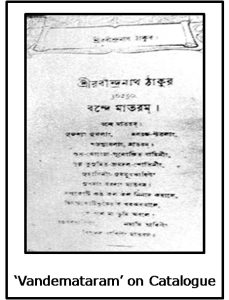 1937 was an important year in the history of Tagore songs. That was the year when Tagore songs used in a film found place on records, for the first time. 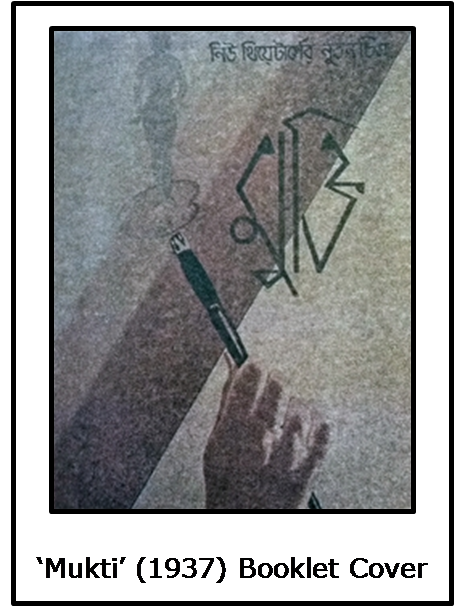 Pramathesh Barua had been making ‘Mukti’, under the New Theatres banner. The script had been read out to Tagore, for a certain reason (which isn’t relevant for this article) after which, the poet had shown interest in his songs ‘Aaj sobar range rang mishate hobe’ and ‘Tar bidaybelar malakhani’ being used in the film. Even the title of the film, ‘Mukti’, was his suggestion. Kanan Devi, the lead actress of the film, sang the songs suggested by Tagore for her character Chitra, under the able guidance of Pankaj Kumar Mullick, and those became big hits! While recalling memories of recording Rabindrasangeet, Kanan Devi later said, “While singing Tagore’s songs, my realizations would blossom and I’d feel as if I’ve overcome all pains and am standing in front of the Supreme’. Tagore had continued the task of listening to the sample discs of his compositions made by several record companies till his final days. Those were the days when the companies sent their sample discs to Santiniketan, which then, would be listened to by Tagore (or the ones he confided on), before being approved. Else, the records were rejected, and never saw the light of the day. On 3rd December, 1939, Tagore had composed a song, ‘Samukhe santiparabar’. The poet had hoped, this would never be sung, until he left the mortal world. 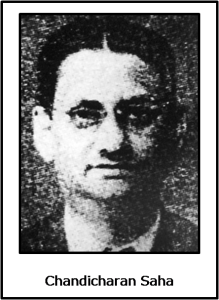 As per his wish, the very day he left his last breath (7th August, 1941), Shailajaranjan Majumdar taught the tune to the young students Indulekha Ghosh and Kanika Mukherjee (later Banerjee) who sang the song in the ashram, with eyes overflowing with tears. Kanika later recalled, “I still recall, Gurudev (Tagore) would sing ‘Samukhe santiparabar’ himself, during the rehearsals of ‘Dakghar’ (one of Tagore’s plays) and say, ‘sing it after I die’. Our hearts would be filled with sorrow.” The same year, ‘Samukhe santiparabar’ was recorded by Kanak Das and Shaila Devi for the ‘His Master’s Voice’ and the ‘Senola’ companies respectively. In front lies the ocean of peace. Take O take him in your lap. Those lines definitely marked the end of an era! The set of the Sun. Of course, the light that it had, had all been spread around the world, the smell of which lingers still, and would linger forever! This article is P.hd material, not even P.G level . So vast and extensively researched along with the relevant videos. Hope this finds its way into a rich and glossy coffee table book. God bless u in all such endeavours of yours.